Not to be confused with chain gang. The chain crew at work during a Rutgers Scarlet Knights football game. In gridiron football, the chain crew (commonly known as the "chain gang") are three people, each of whom holds vertically a signal on a pole on one of the sidelines. The chain crew, under the direction of the linesman, signals the officials' decisions; it does not make decisions. Players look to the chain crew to see the down number and the line to gain. Officials may rely on the chain crew after a play (incomplete pass or penalty) whose outcome depends on the original spot of the ball. A "rod man" who holds a pole (the "rear rod") that marks the beginning of the current set of downs. A "box man" who holds a pole with an indicator of the current down at the top (the "box"). Another "rod man" who holds a rod (the "forward rod") ten yards toward the defense's goal-line from the rear rod man. This marker indicates a line on the field — the "line to gain" — that the offense must reach in their series of four downs in order to retain possession of the ball. The two rods (sometimes known as "sticks") are attached at the bottom by a chain exactly ten yards long; when taut, the rods are ten yards apart. Members of the chain crew are usually picked by the offices of the home team instead of the league or conference. In the NFL, members of the chain crew must have credentials entitling them to access to the field, and must wear white shirts. The chain crew does not wear protective gear as players do. A routine instruction by officials to the chain crew is to withdraw or drop their signals, and move back, if the play comes toward them so as to endanger them. The signals often use bright orange color and are padded to minimize injury. For games at all levels below the NFL, the chain crew operates on the side of the field opposite the press box and home team (the side of the visiting team). In the NFL, the chain crew switches sides at halftime; the referee determines their initial placement. 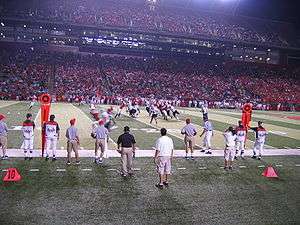 On fields where both teams' benches are located on the same side of the field, the chain crew operates on the opposite side for the entire game. In the NFL and other venues where there is a zone behind the sidelines, all three poles are placed somewhere along the back line of this zone. Otherwise, the poles are placed along the sideline. For professional and college football games, an auxiliary chain crew operates on the opposite side of the field. Their function is to let players and officials look to either side of the field for information. The auxiliary chain crew also includes the drive start indicator, which is placed at the beginning of a team's drive and stays there until the team loses possession. This indicator is only used for statistical purposes to calculate the distance of each drive. It looks similar to a "stick" and has an arrow (or occasionally a large "X") that points in the direction the offensive team is going. At the start of a series of downs, the linesman stands so that the heel of one foot marks the initial line of scrimmage. The box man places his indicator to mark this position and sets the box to display "1". The operator of the rear rod marks the same position, while the other rod man moves ten yards toward the defense's goal line to mark the line to gain. The linesman, the box man, or a fourth member of the chain crew attaches a "clip" to the chain to line up with the rear edge of the closest five-yard line to the rear rod. A device on the clip indicates which numbered line this is. The clip and the device let the chain crew restore the position of the rods after a mishap. After a typical play, the box man increments the displayed number and realigns that pole to the new line of scrimmage, again as directed by the linesman. After a play that results in a first down, all three members move and reset their signals to mark a new series of downs. The chain crew must not move until the referee or linesman signals whether the play finished without a penalty. On a penalty, the chain crew stays put so that the officials can see the original state. When the referee and linesman walk off the appropriate number of yards, the box man moves as well. The box man does not change the number displayed, except on a penalty that results in a loss of down. On a penalty that results in a first down, the entire chain crew moves and resets. When possession of the ball switches to the other team, the forward rod becomes the rear rod and vice versa to minimize the distance the rod men have to move. However, at the end of the first and third quarters, when players switch directions on the field, the chain crew also moves (for example, a marker may move from one 32-yard line to the other 32-yard line). The rear rod man moves past the forward rod man and continues to mark the start of the series of downs, in the new orientation, using the clip to exactly reposition the chains. On plays where there is no concept of first down (a series of downs that starts within 10 yards of the goal line, a try after touchdown, or a kickoff), the rod men lower or lay down their signals, but the box man continues to mark the line of scrimmage. A first down measurement during a game between the USC Trojans and the California Golden Bears. The chains are brought onto the field whenever the referee needs an accurate measurement to determine if a first down has been made. A team may also request an accurate measurement to determine how far they have to reach for the first down. Before the game, many linesmen attach a piece of tape at the midpoint of the chain. The linesman can compare the line of scrimmage to this mark at the start of a play and know whether a 5-yard penalty against the defense will result in a first down. All levels of organized football use the chain crew. One notable exception at the professional level was the World Football League of 1974 to 1975, which used the "Dicker-rod," a proprietary, 90-inch stick that allowed measurements to be made with one person instead of three. The Dicker-rod was never used outside the WFL. In the Official Rules of the NFL, the chain crew is described in Rule 1-5. The linesman's instructions to the chain crew are described in Rules 15-4-3 through 15-4-5. ↑ Skip Harrison. "Chain Gang". Retrieved 2016-12-02.